On 3 January 2019, Mr. Chen Dehai, Secretary-General of ASEAN-China Centre (ACC) met with Mr. Piriya Khempon, Ambassador of the Kingdom of Thailand to China at ACC Secretariat, and exchanged views on promoting Thailand-China and ASEAN-China cooperation. Mr. Mongkol Visitstump, Deputy Chief of Mission of Royal Thai Embassy to China, Ms. Wang Hongliu, Director of General Affairs and Coordination Division of ACC and Ms. Kong Roatlomang, Director of Education, Culture and Tourism Division of ACC attended the meeting. 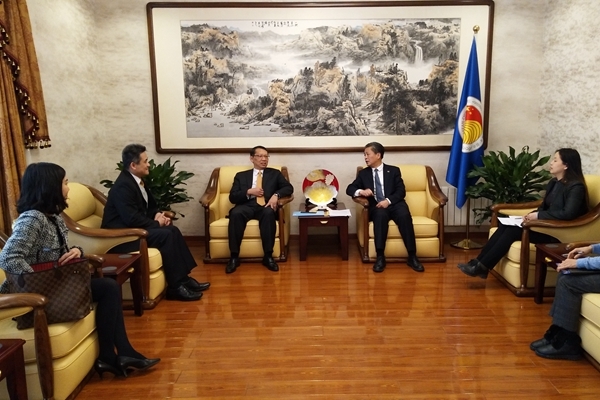 Secretary-General Chen Dehai thanked the Royal Thai Embassy in China for the long time support to ACC. 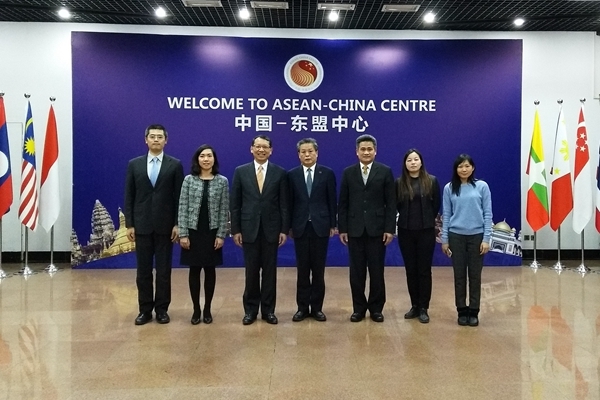 He briefed on ACC’s work plan in 2019 and hoped to further strengthen cooperation with the Embassy during Thailand’s chairmanship of ASEAN, so as to jointly advance the ASEAN-China friendly exchanges and practical cooperation. Ambassador Piriya spoke highly of ACC’s role in promoting ASEAN-China practical cooperation. He said the Embassy will continue to support ACC’s work, and expected to enhance communication and coordination with ACC, through jointly carrying out various activities to further expand the cooperation and inject new momentum to the development of ASEAN-China strategic partnership.